These two episodes are ostensibly a two-parter linked as they are by the character of Ashildr (Maisie Williams). But they don’t follow immediately on from each other. Indeed, The Girl Who Died is written by Jamie Mathieson and Steven Moffat, whilst The Woman Who Lived is written by Catherine Tregenna. The Girl Who Died seems to be a straightforward base under siege story – if the base is a Viking village. The Doctor and Clara turn up, defeat the enemy with a combination of intelligence and potential internet-based humiliation. 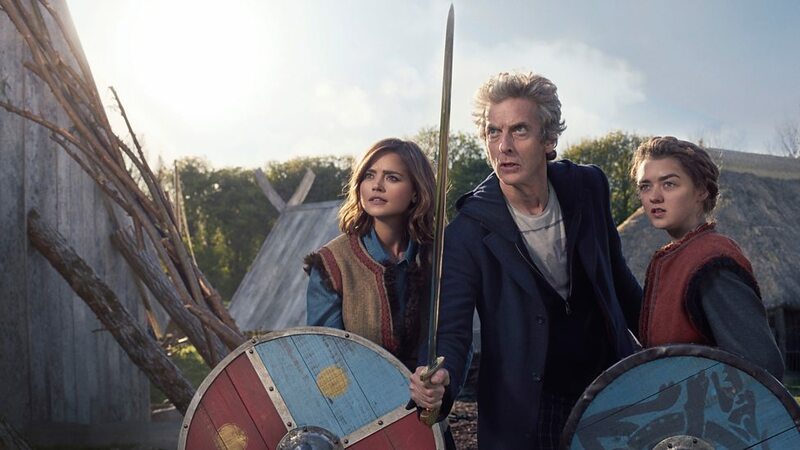 In the process though we’ve been introduced to Ashildr, who is a young Viking woman that immediately draws the Doctor’s attention. Ashildr is different. She’s a dreamer and a creator. It’s her creation that helps defeat the Mire (for that is the name of the cruel but brutishly easily dispatched enemy.) In saving her village though Ashildr dies. But the Doctor is in one of his moods. He’s tired of losing people so, after a moment of reminding himself why he chose his current face (which is a scene I like) he decides to save Ashildr using a chip cobbled together from Mire technology. In doing so though he doesn’t consider – or doesn’t want to consider – the consequences, which is that he has made Ashildr functionally immortal. He doesn’t dwell on that for long, but he is aware that he might have made a mistake. The Doctor also throws in the first mention of ‘hybrid’, which we are led to believe by the weight it is given might turn out to be important. We shall see. The episode ends, not with what one might call a proper cliffhanger, but a beautifully filmed scene where we see Ashildr standing looking at the countryside and sky. Then we realise that time is passing. Sun flies past sun. Day follows night. And Ashildr’s expression changes from happy to angry. It’s a brilliant short-cut to show the impact of immortality on Ashildr. Everyone involved in that scene deserves a round of applause – the writer’s, Ed Bazelgatte, the Director and Maisie Williams as Ashildr. It still has an impact now on re-watch. Even as I know it is coming. The Woman Who Lived picks up much later. It’s England. The time of the Commonwealth. 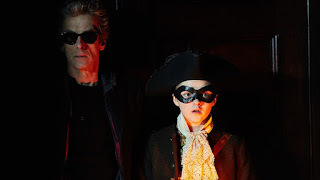 Ashildr – or Me as she prefers to be called – is a highwayman. And she’s got a plan to get her off the planet. Whatever the theoretical plot of this episode – alien has artefact & wants to use it to do something nefarious – that’s not the point of it at all. This is an episode that – for all its laughs, often provided by Sam Swift (Rufus Hound) – is a meditation on immortality and the consequences of the Doctor’s involvement in the world. Ashildr/Me’s life, which is outlined on shelf after shelf, is a living reminder of what happens when the Doctor gets involved in your life without thinking of the consequences. It’s also a reminder that immortality is not all it is cracked up to be, which I think is an ongoing theme of Steven Moffat’s Doctor Who: the value of a short life lived to the full versus the cold, cold emotional life of an immortal. There’s only so many family, friends, lovers and children you can lose before it starts to make you cold. Unless, as the Doctor does, you travel with us mayflies. As a reminder of the value and joy of life. Ashildr/Me has managed to convince herself that she doesn’t care for anyone. She doesn’t even remember all the people she’s known and loved. Her initial home, which she would have died for, and her father are all memories lost to her. She has written down what she can remember but has torn out some of the pages. Those that are the most painful. Except those that describe the death of her children. As a reminder never to have any more. Ashildr’s story is heartbreaking, but the Doctor – and her own actions – draw her out of herself and (almost) final scenes have her and the Doctor talking over a pint about why he can’t take her with him and why she will now spend her time tidying up after the Doctor’s interference on Earth. Once more The Doctor is accused of running away. Of not dealing with the consequences of his actions and there’s a good case to be made on that score. The interesting thing about The Woman Who Lived is we are without Clara so that The Doctor and Ashildr/Me can be given the dramatic weight it deserves. Clara would have been a distraction. Here the Doctor is forced to face the consequences of his actions, even if he feels that he isn’t entirely to blame for what Ashildr has become. But then he admits to having seen her before now and not saying anything or doing anything, which seems harsh to me. This is a fine two-parter. It plays with the format. It’s well-directed and well-written, even if the basic plots of the two episodes are pretty perfunctory. It’s the arc of Ashildr/Me that makes it excellent. There’s some good acting too. Not just from Capaldi and Coleman, which goes without saying these days. 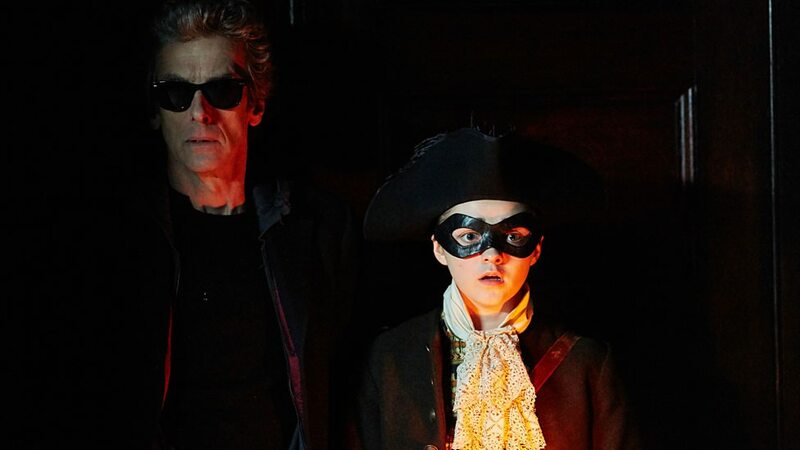 Although I’d say some of Capaldi’s scenes with Maisie Williams are amongst his best work in the part – so far. I also enjoyed Maisie Williams performance and I’m assuming she’s going to pop up again before we’re done. Plus, a round of applause for Rufus Hound who I enjoyed a lot as the rather useless Sam Swift. This didn’t reach the heights of The Wizard’s Apprentice/The Witch’s Familiar, which is the season’s strongest story so far, but it managed to combine telling a story and examining the Doctor’s life without becoming either boring or self-indulgent.